Thick fog on the last day of 2017 affected flight operations at Indira Gandhi International Airport today. As visibility fell below the minimum needed for flight operations, landings and take-offs were stopped for a few hours, airport officials said. All domestic and international flights at Delhi airport were put on hold between 8 am and 10 am on all the three runways after visibility fell below 50 metres -- less than the minimum needed for flight operations -- due to dense fog. Some flights were also cancelled. Flights started landing again just after 10 am and take-offs resumed after 11:30 am, airport officials said. "Dense fog at @Delhi_Airport today #CATIIIB Glad we could land @airindiain AI142 Before time," Air India pilot Nivedita Bhasin tweeted at 10:41 am. 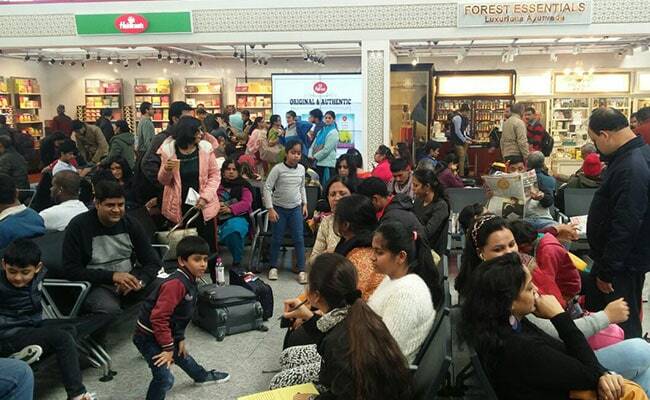 More than 40 flights were diverted and over 90 flights were affected at Delhi airport before flight operations resumed, news agency ANI reported. The temperature today morning in Delhi was recorded at 6.4 degree Celsius, a notch below the season's average, the weather office said. At least 15 trains were cancelled, 57 delayed and 18 rescheduled due to fog in several parts of northern India, news agency IANS reported. The India Meteorological Department said the sky would remain clear. The traffic police had asked motorists to drive with extreme caution on highways and the Yamuna Expressway. Yesterday, Delhi recorded a minimum temperature of 7.2 degree Celsius; the maximum temperature was recorded at 22.6 degree Celsius. The weather office has said temperature is likely to fall further in the coming days. People wait for announcement of their flight status after low visibility affected flight operations at Indira Gandhi International Airport in Delhi today. Delhi has been intermittently seeing heavy smog for the last two months, right from around Diwali, due to a range of pollutants building up in the city from sources such as automobile emissions, road dust, industrial emissions and huge volume of smoke as a result of crop-residue burning on vast swathes of land in neighbouring Punjab and Haryana. The Central Pollution Control Board or CPCB has asked government agencies to be ready to take emergency measures in case air quality worsens too much around New Year. For example, the Delhi Pollution Control Committee or DPCC and municipal corporations are responsible for taking action against those who are found burning coal and firewood in the open. 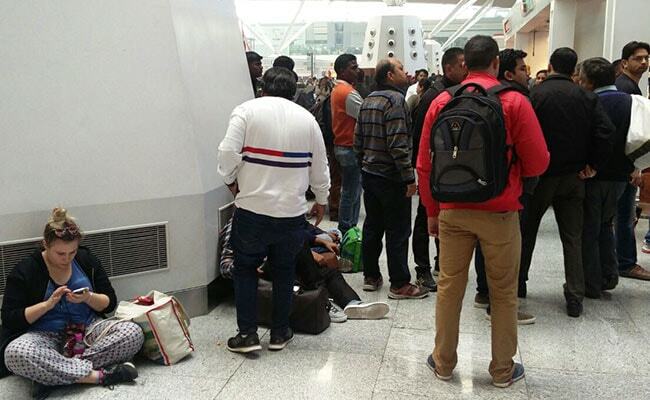 People wait for their flights to depart after low visibility hit flight operations at Delhi airport. According to environmentalists, some of the factors that contribute immensely to worsening air quality in the national capital are badly maintained vehicles that emit visible smoke, large diesel generator sets, crop-residue burning in neighbouring states and urban industrial emissions. Earlier this month, the National Green Tribunal dismissed a review by the Arvind Kejriwal government to keep two-wheelers out of the odd-even vehicle rationing plan that has to be implemented when air quality fall below a certain level. The green court said many two-wheelers on Delhi's roads are old and do not conform to air pollution norms.